Singer-songwriter, guitarist, former child actor. Nathan Cavaleri (born 18 June 1982) is an Australian blues rock singer-songwriter and guitarist, and a former child actor. He issued two albums as a solo artist, Jammin' with the Cats (1993) and Nathan (1994). He has been a member of various groups including Dirty Skanks (2003–10), and Nat Col and the Kings (2010–present). At the age of six Cavaleri was diagnosed with leukaemia and has been in remission since he was 13. As a child actor he appeared in the American film Camp Nowhere (1994) and starred in Paws (1997). Nathan Cavaleri was born on 18 June 1982 and grew up in Ruse, New South Wales. His father, Frank Cavaleri, was a bricklayer and part-time guitarist; his mother is Joanne and the couple also have a younger son. Cavaleri began playing guitar at the age of five; he began by using a full-sized guitar with a shaved neck – to accommodate his smaller hands. Cavaleri was diagnosed with leukaemia at age six; he continued playing guitar to take his mind off the disease. He received chemotherapy treatment and, by May 1993, he was in remission. He asked the Australian branch of Starlight Children's Foundation, a charity organisation, to fulfil his wish – at the age of nine he played with Mark Knopfler; he described Cavaleri's playing as "unbelievable". Knopfler also donated a gold plaque awarded to his group, Dire Straits, for their album, Brothers in Arms (1985). Regarded as a child prodigy, Cavaleri was later trained by, and at age thirteen, eventually toured with, B.B. King. King described Cavaleri as "the future of the blues". In May 1992 Cavaleri released his debut single, "Little Egypt", which was a cover version of Elvis Presley's track from 1964, and peaked at No. 63 in Australia. Its B-side, "Nat's Blues", was co-written by Cavaleri with his father, Frank. On 12 April 1993 he issued his debut album, Jammin' with the Cats, on Mushroom Records, which was produced by "Buzz" Bidstrup (Riptides, GANGgajang, The Sunnyboys). Bevan Hannan of The Canberra Times described Cavaleri as a "super guitar technician" and felt the album "range[s] from shuffle, blues and jazz to out and out rock. It is the type of music you would expect to hear on a tonight chat show." For the album he worked with Jimmy Barnes, Diesel and Tommy Emmanuel. It peaked at No. 33 on the ARIA Albums Chart. In September 1993 Cavaleri and Barnes released a cover version of The La De Das' single, "Gonna See My Baby Tonight", from November 1971. Fifty thousand promotional copies were included as give-aways in Uncle Tobys breakfast cereal boxes. Barnes provided lead vocals, rhythm guitar and produced the track, Bidstrup was on drums, Michael Hegerty on bass guitar and Jeff Neill on rhythm guitar and backing vocals. For his second album, Nathan (1994), he used Teddy Andreadis on keyboards, Sweet Pea Atkinson on vocals, Curt Bisquera on drums, Jeff Berlin on bass guitar, Randy Jacobs on guitar and Andrew Strong on vocals (ex-The Commitments). AllMusic's Erik Crawford noted that "he delivers jaw-dropping solos on track after track" as he "offers up an earthy blues effort that fits nicely alongside other teen blues sensations." The album provided two singles, "Workin' on It" (September 1994, No. 55 in Australia) and "If Loving You is Wrong" (March 1995). For its United States release, Cavaleri signed with Epic Records and Michael Jackson's label, MJJ Music. He released three albums with Epic Records. He has also played with Robben Ford, and Aaron Neville, His music is featured on the soundtrack for Free Willy 2 (1995), and he has served as a spokesman for Peavey Guitars. In November 2004 Cavaleri reflected on his early career "When I was doing all of that stuff (it) doesn't even feel like it was my life ... It feels like a haze. It feels like a dream. It just feels like images in the head, almost like a western movie." Cavaleri was managed by Jane Barnes (wife of Jimmy Barnes) and, with his parents, he decided to pause his musical career – he finished secondary school and became a brickie's labourer "I just totally escaped music ... It can be a dark time when you’re finding yourself creatively." On 18 October 2000 Cavaleri performed during the Opening Ceremony of the 11th Paralympic Games in Sydney. In 2003 he formed a group, Dirty Skanks, with Col Hatchman on drums, then a member of The Screaming Jets. By 2010 Dirty Skanks was renamed as Nat Col and the Kings. Cavaleri writes and arranges his own material as the group tours, by 2012 the line-up included Toni Bird on backing vocals and Kenny Jewell on bass guitar. Following the disbanding of Nat Col and the Kings, Nathan continued with a solo career. ^ a b c d Schwartz, Larry (29 May 1993). "Teddy Bears & Top 10's". The Age. stuffedbears.com.au. Archived from the original on 29 November 2014. Retrieved 19 November 2014. ^ a b c d "Artist of the Month: Nathan Cavaleri". H.E.A.R. (Hearing Education and Awareness for Rockers). December 1995. Retrieved 20 November 2014. ^ a b c Huey, Steve. "Nathan Cavaleri". AllMusic. Retrieved 20 November 2014. ^ a b c d e f g h i j McFarlane, Ian (1999). "Encyclopedia entry for 'Nathan Cavaleri'". Encyclopedia of Australian Rock and Pop. St Leonards, NSW: Allen & Unwin. ISBN 978-1-86508-072-7. Archived from the original on 1 September 2004. Retrieved 19 November 2014. ^ Holmgren, Magnus. "Graham Bidstrup". Australian Rock Database. Passagen.se (Magnus Holmgren). Archived from the original on 22 October 2013. Retrieved 20 November 2014. ^ "Good Times: Disc Review: The funky feel grabs you by the ears". The Canberra Times (ACT : 1926 - 1995). National Library of Australia. 17 June 1993. p. 28. Retrieved 20 November 2014. ^ Hung, Steffen. "Discography Nathan Cavaleri". Australian Charts Portal. Hung Medien (Steffen Hung). Retrieved 20 November 2014. ^ Crawford, Erik. "Nathan Nathan Cavaleri Band". AllMusic. Retrieved 20 November 2014. Note: user may have to click on 'Credits' tab to access further information. 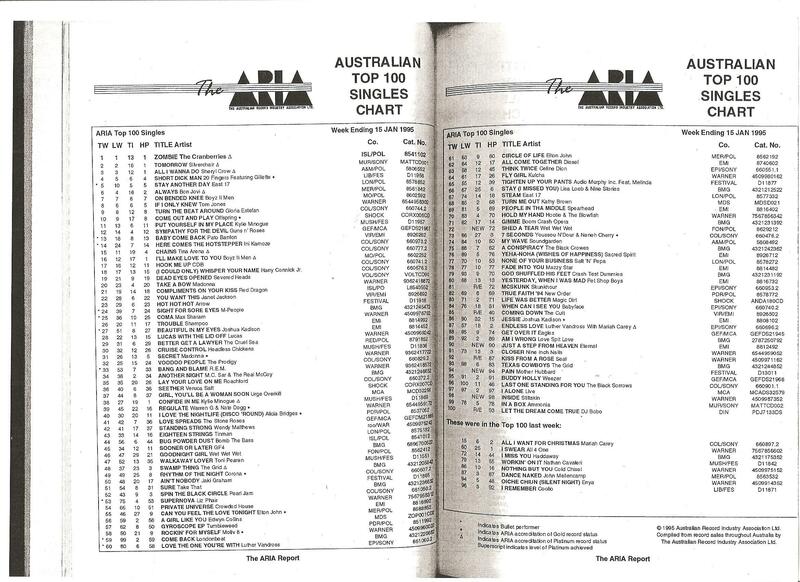 ^ "The ARIA Australian Top 100 Singles Chart – Week Ending 15 Jan 1995". Imgur.com (original document published by ARIA). Retrieved 9 December 2016. ^ a b Schwartz, Larry (20 November 2004). "Guess who's gone and grown up". The Age. Fairfax Media. Retrieved 20 November 2014. ^ Cameron, Ben (22 September 2011). "Nathan Cavaleri: picking his own path". Bendigo Weekly. Retrieved 20 November 2014. ^ a b Edwards, Amy (12 August 2010). "New band for child prodigy Nathan Cavaleri". The Newcastle Herald. Fairfax Media. Retrieved 20 November 2014. ^ Rivas, Pete (11 September 2012). "Interview: Nathan Cavaleri of Nat Col and the Kings (Sydney)". The AU Review. Heath Media & the AU review. Retrieved 20 November 2014. ^ Long, Benjamin (14 September 2012). "A return to fiery roots". Illawarra Mercury. Fairfax Media. p. 41. Retrieved 20 November 2014.